Volkswagen's Arteon, the replacement for its previous Passat-based CC model, has lofty aspirations. Jonathan Crouch reports. 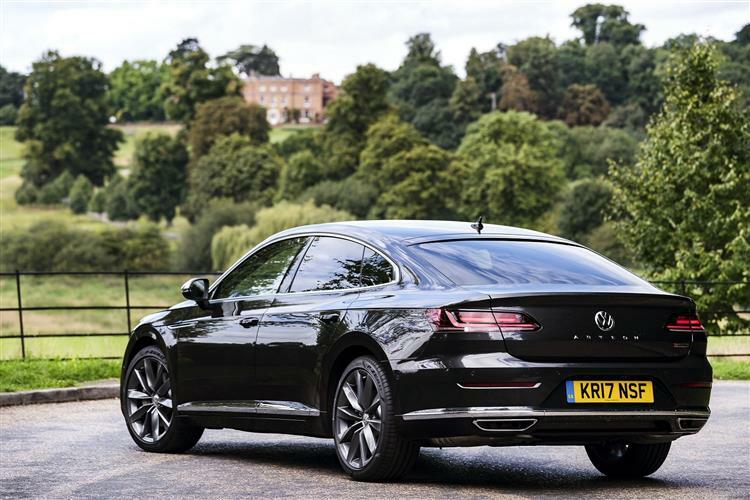 Volkswagen's sleek Arteon is a four-door coupe that offers a sleeker, yet still very practical alternative to style-conscious compact executive segment models like Audi's A5 Sportback, BMW's 4 Series Gran Coupe and Alfa Romeo's Giulia. It's a design styled with much more individual identity than was the case with the old CC model, a high class car that doesn't need a ridiculously expensive bootlid badge to stand out. And a very desirable one indeed. Uniqueness is a quality you usually have to pay royally for, especially when it comes to cars affordable enough for you and I to consider. Once upon a time, drivers seeking it in the Mondeo medium range market would pay a premium for a prestigious badge and feel themselves special with an Audi, a BMW or a Mercedes on the driveway. But in an age where so many now do just that, you begin to wonder these days just how special that would be. So what if uniqueness - specialness - in a car of this kind were to be not in the badge on your keyfob but in the design of the car itself? Something very different from anything else you could buy for the money. Something like this, the Volkswagen Arteon. Quite a few of the underpinnings used in this model are borrowed from humbler members f the Volkswagen line-up - but then that's also the case with obvious rivals. It's the dressing that counts, which in this case is very smart indeed and built around a whole raft of efficient high technology. Let's check it out. 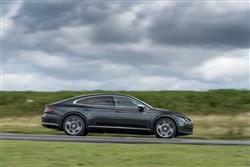 British buyers will get the Arteon with a choice of five engines. Diesel folk choose between a 2WD 2.0 TDI 150PS model with manual or auto transmission. Or a 4MOTION 2.0 TSI 240PS auto-only variant. For petrol people, the choice is between a 2WD 1.5 TSI ACT variant with 150PS and manual or auto transmission. Or a 190PS 2.0 TSI variant which comes in 190PS form with 2WD or in 272PS form with the 4MOTION set-up. The 2.0 TSI derivatives are auto-only. 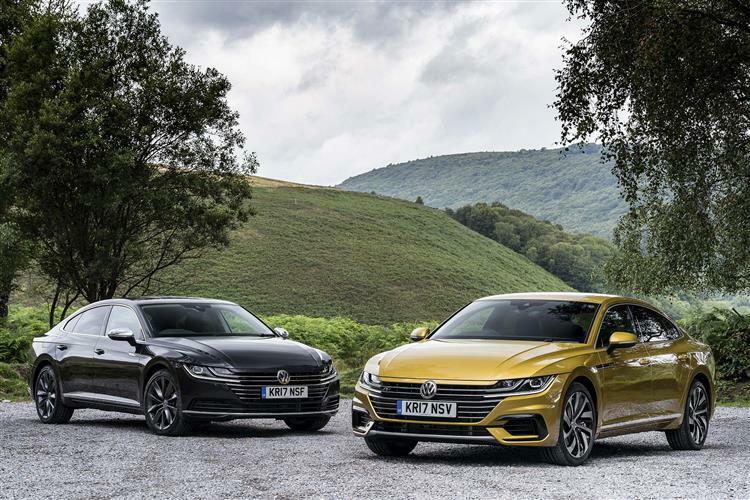 Under the skin, the Arteon rides on the same MQB platform as Volkswagen's current Golf, Passat, Tiguan and Touran models. On the road, early reports suggest that you can expect luxury segment standards of ride, even if you specify the huge optional 20in wheels and low-profile tyres. There's an adaptive damping system and standard 'progressive' variable-rate power steering. Don't expect the combination to deliver BMW 4 Series Gran Coupe standards of driver involvement though. As for performance, the 2.0 TSI 272PS petrol model makes 62mph from rest in 5.6s on the way to an artificially-restricted top speed of 155mph. For the 240PS diesel, the figures are 6.5s and 152mph. 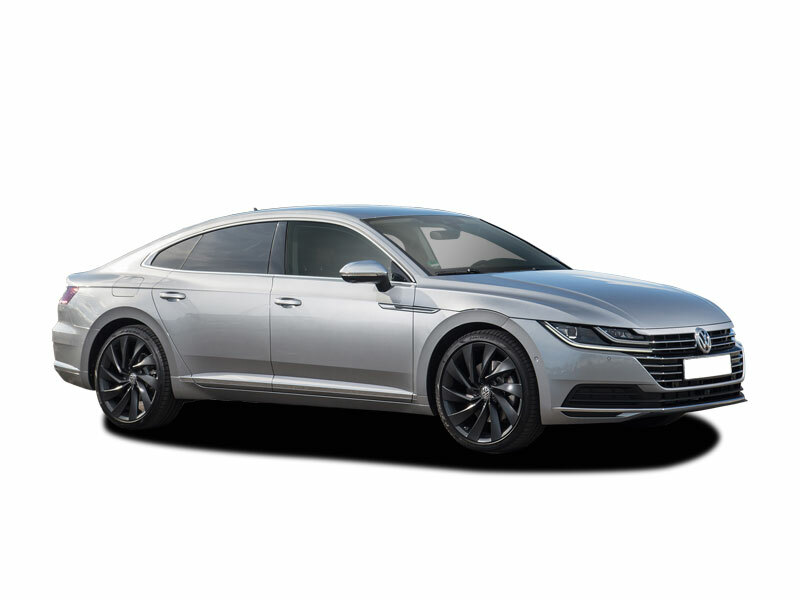 The CC model that this Arteon replaces was very much Passat-based. This design though, is very much its own car. Its wheelbase is longer than a Passat, its axle tracks are wider, its roofline is lower and its driving position is significantly different. What is familiar from before is the styling approach used, so as wth the CC, buyers get frameless doors and a plunging rear roofline, the aesthetics based on the 'Sport Coupe Concept' prototype that Volkswagen showed in Geneva back in 2015. 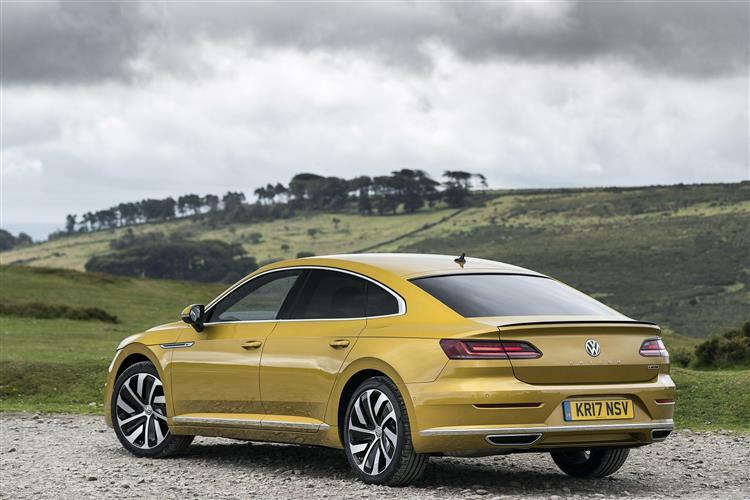 The long bonnet is certainly eye-catching, dipping into the wheelarches and meeting the smartly stylish LED headlights with seamlessly integrate into the wide, horizontal grille, creating a look that Volkswagen says will be seen in many of its next generation models. The five-door coupe roofline is paired with a prominent character line running from the headlights to the tail-lights, creating distinctive shoulder haunches towards the rear. At the back, sleek horizontal LED tail-lights are sited beneath a small lip spoiler on the hatch lid, which opens up to reveal a 563-litre boot. At the wheel, it all looks much classier than a Passat. And in the rear, there's much more passenger space than either the current Passat or the old CC model could provide. This car feels like it's almost gone up a class in size. 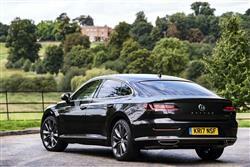 The old CC model was priced just below potential rivals like BMW's 4 Series Gran Coupe and Audi's A5 Sportback. This Arteon is priced just above them. Expect to pay in the £31,000 to £40,000 bracket for the various engines on offer, with most customers likely to opt for the 150 and 240PS 2.0 TDI models. If in future, Volkswagen's UK distributor decides to flesh out the range with more affordable engines, that could change. Wolfsburg's 150PS 1.5 TSI EVO petrol unit from the Golf is also available. Buyers are offered 'Elegance' and 'R Line' trim options (the latter with sports suspension). Either way, there's loads of kit provided as standard - as you'd expect for the money being asked. Predictably, the Arteon gets the same Active Info Display digital instrument display that's optional on the Golf. It works well, apart from the 'gesture control' functionality - which is awkward to activate. As for safety, there's a barrage of camera-driven standard features. Autonomous braking naturally makes the kit list, as does 'Emergency Assist' which merges ACC (Adaptive Cruise Control), Side Assist, Lane Assist and Park Assist into one system. The set-up cuts in to slow you to a safe stop should you be taken ill at the wheel. 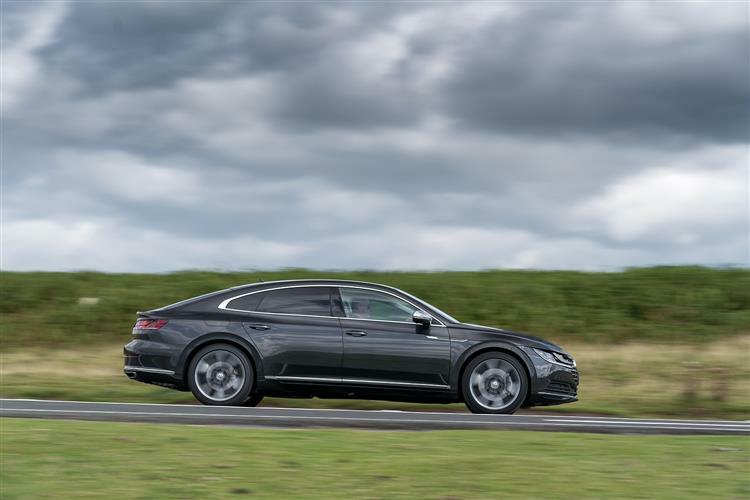 As you'd expect, the Arteon is extremely class-competitive in terms of running costs. The 2.0 TDI 150PS variant that most will choose manages 62.8mpg on the combined cycle and 116g/km of CO2 in DSG auto form - not bad for a 137mph luxury conveyance. 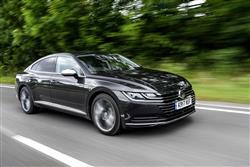 The alternative 240PS 4MOTION 2.0 TDI model delivers 47.9mpg and 152g/km. The 272PS 2.0 TSI petrol model manages 38.7mpg and 164g/km. As for servicing, well as usual with Volkswagen models, there's a choice of either 'Fixed' or 'Flexible' maintenance packages. You'll choose the 'Fixed' approach if you cover less than 10,000 miles a year and with this, the car will typically be looked at every twelve months. 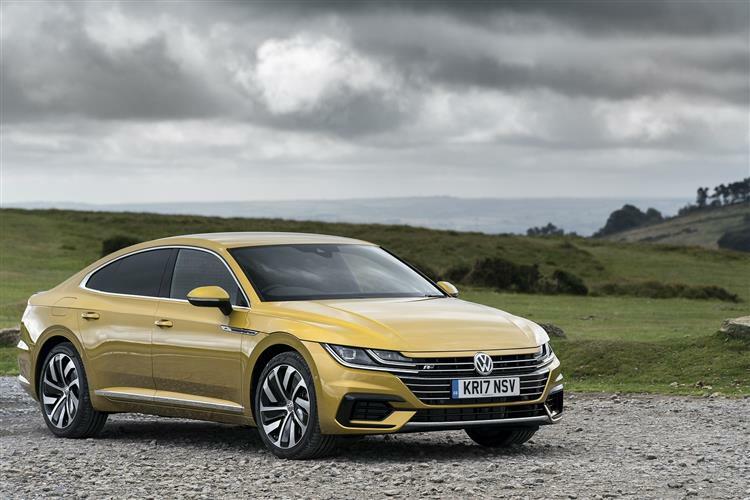 If your daily commute is more than 25 miles and your Arteon will regularly be driven on longer distance journeys, you'll be able to work with a 'Flexible' regime that can see you travelling up to 18,000 miles between garage visits - or every two years, whichever is sooner. And warranties? Well the standard package is three years and 60,000 miles. Plus your car will come with three years of pan-European Roadside Assistance that has no mileage restriction. The paintwork warranty lasts for three years and, as you'd expect, this model is protected by a 12-year anti-corrosion package. To find your nearest Volkswagen branch, please enter your location.